Whenever the U.S. military releases images of its latest badass hardware under development, we usually see futuristic, 3D renderings that look like screenshots from the latest videogames. 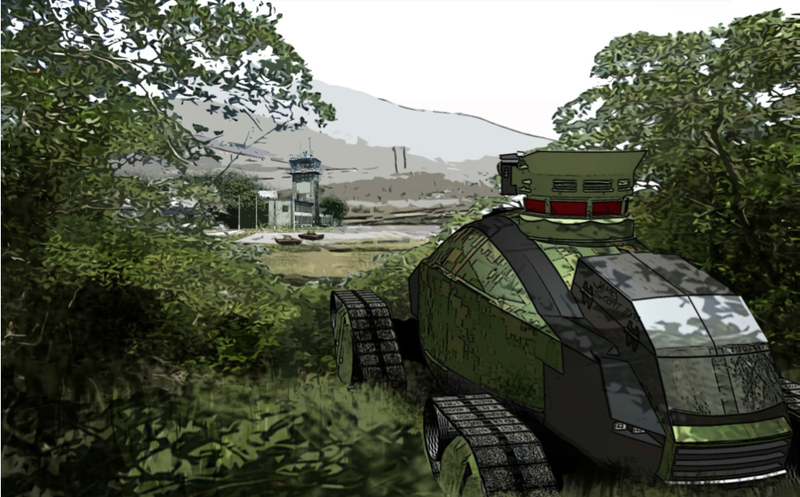 But a presentation of the proposed Ground X-Vehicle opted for a more stylish, pseudo-anime look. As described over at the blog War Is Boring, the Ground X-Vehicle (GXV) is "supposed to represent a new concept in tank survivability. Instead of the traditional method of adding thicker armor — which inevitably results in a heavier vehicle — the Pentagon wants to apply advanced technology to keep its future tank light and well-protected." The result is a tank that doesn't look like the armored behemoths we know today, but a vehicle that stresses agility, stealth and adaptability: for instance, moving its armor to protect specific sections or leaping over bombs. Avoiding damage from a roadside bomb by elevating its chassis three feet in the air. Tank taking advantage of its petite profile to hide in ambush behind parked cars during an urban battle, as what appears to be a Russian-style tank passing by unaware. Light enough to be transported by helicopter. What's striking about these drawings is their emphasis on survivability. They don't show traditional armored combat, nor do they depict a long-range gun duel with enemy tanks. They do show the GXV in numerous urban warfare situations, or deploying behind enemy lines by helicopter. If these are the hypothetical battlefields guiding the Pentagon's future tank design, this suggests that the military is anticipating a future of armored warfare as different from World War II and Desert Storm as D-Day was from Waterloo and Cannae. See more images in the U.S. Army document, GXV Operational Vignettes.